KAWAN Food Bhd’s state-of-the-art manufacturing facility in Pulau Indah, Klang, took almost four years to be completed, due to setbacks in the construction work, but the company is now raring to make up for lost time. “The main cause of the delay was the refrigeration issue we had with the contractor. That delayed us quite a bit. Basically, a lot of things had to be redone in that area,” Kawan Food managing director Timothy Tan tells The Edge. The RM200 million Pulau Indah facility has at least three times the production capacity of its older factories in making paratha and chapati, says Tan. This means a potential revenue of RM360 million from paratha and chapati production compared with RM120 million in FY2017. Frozen paratha and chapati are Kawan Food’s most sellable products, contributing about 60% to total revenue. The remaining 40% comes from a variety of frozen products like vegetables, spring roll pastry and glutinous rice balls. The company’s products, especially its frozen paratha and chapati, have a large international market, considering that exports account for 61% of total revenue with the rest coming from the local market. Kawan Food’s biggest export market is the US, contributing 44% to total export revenue. Nevertheless, revenue from America fell 27% year on year to RM21.7 million in the first half of the year, causing total revenue to decline 3.8% year on year to RM98.7 million. 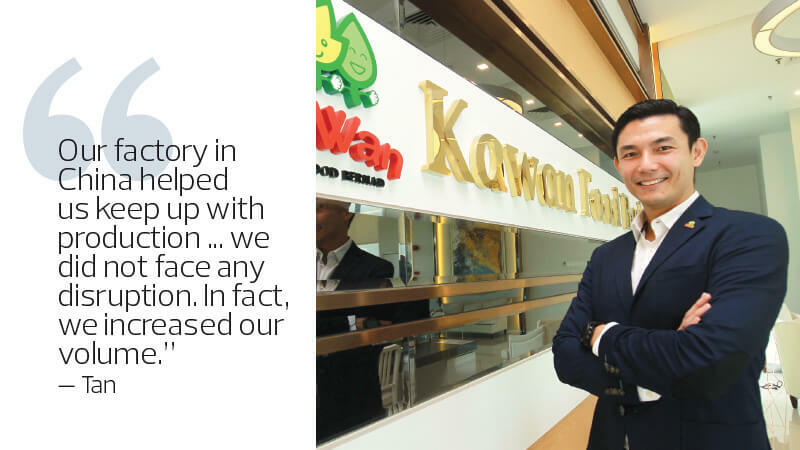 While Kawan Food and its distributor in the US are working hard to get sales up again, Tan shares that the company is looking at widening its clientele there. Currently, most of its US customers are traditional retailers but Tan believes it is now time for Kawan Food to tap the mainstream American consumer with its new products, given that the company has been in the US market for a long time and has built a good network. He says Kawan Food is currently in talks with its American partners and he expects the negotiations to bear fruit some time next year. The company will slowly increase the export of some of its new products to the mainstream US market, starting with the food services industry and then moving on to the retail outlets, he adds. “There is huge potential in the food services industry. I would say our strength is mainly on the retail side now. We would like to spend a bit more time and effort on food services because we see the importance of the industry during good economic times. When the times are good, people tend to spend more on eating out and when they are bad, people prefer to cook at home,” Tan points out. Among the new products the company is coming up with are “slacker” items, or fresh frozen. This is where the parathas are cooked further to increase customer convenience as they would only require reheating. The fresh frozen parathas are shipped frozen and then put into chillers to sell. Their shelf life ranges from two to four weeks in the chiller. Kawan Food has also included snack or finger foods in its portfolio. These are currently available in the domestic food services industry and will hit the retail outlets early next year, says Tan. One product that has gained traction over the last few years, taking even the company by surprise, is its tortilla wraps. “The tortilla wraps are really popular in the Chinese market. We have seen the numbers grow from 19,777 cartons in 2016 to 129,320 cartons as at end-September this year. I believe it is worth investing more time and effort on this product in China,” says Tan. Apart from new products, the company will also venture into e-commerce by the end of the year to market and sell its products locally, he adds. Diversifying into e-commerce is expected to provide a better platform for its local customers as it will cut the time it takes a product to reach them compared with waiting for it to reach the supermarkets. Tan forecasts revenue for FY2018 ending Dec 31 to be higher than in the previous year but sees net profit dipping because of the start-up cost and depreciation charges for the Pulau Indah facility. 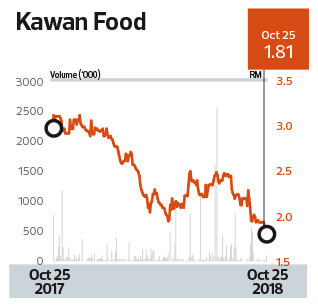 At its RM1.81 close last Thursday, Kawan Food’s share price had fallen 39% over the year. It is trading at a price-earnings ratio of 26.27 times and offers a dividend yield of 1.38%.